Pansies are beautiful garden flowers that are usually grown as annuals, although they are technically biennials. They are a member of the genus Viola, making them closely related to violets. The most popular pansy purchased at garden centers each spring is Viola × wittrockiana, a hybrid form with many cultivars. Pansies are cultivated in a wide range of colors, ranging from gold and orange to purple, violet, and blue. 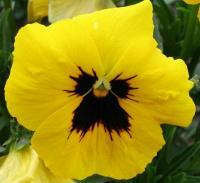 Some pansies have bi-colored petals that are reminiscent of faces. The flowers are about two to three inches (about 6 cm) in diameter. Pansies are grown as edging plants, bedding plants, or container plants. Steps edged with pots of blooming pansies give visitors a cheerful welcome! Pansies are easy to grow! They will survive frosts and light freezes or a little snow, so they can be planted out very early in the spring for early color in the garden. They can also be set out in the fall, and in relatively mild climates will bloom all winter. Regular deadheading will encourage a longer bloom period. They dislike heat, but may bloom through cool summers if they're planted in light shade and kept moist. If the plants get leggy, they can be cut back to encourage another bloom period. Flowers are larger if the plant is regularly fertilized. 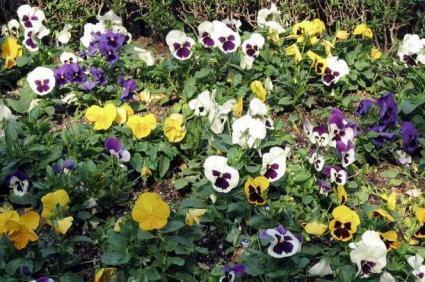 Generally, pansies will not overwinter in the cold climates and will not oversummer in hot climates. Pansies can be propagated by cuttings in the fall. They are more usually grown from seed, which can be planted in spring or fall. Fall planting involves sowing the seed in July in a cold frame. For spring bloom, pansies can be started indoors six to eight weeks before the last frost. Set out the transplants at six-inch intervals in well-composted soil when the seedlings are one to two inches high. For later bloom, pansies can be sown directly in the garden. Cover the seed to exclude light, because seedlings can be killed by too much sun. Seeds germinate in 10 to 14 days at temperatures between 65 and 75 degrees. 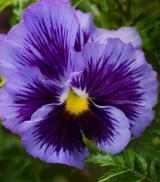 The pansy is named from the French word pensée, which means thought. It is probably named that because the flower petals often resemble a human face and nod forward as if thinking deeply. Its relative, Viola, was named by Greeks in the 4th century B.C.E. and was cultivated for its medicinal properties. Wild pansies lived in alpine meadows and on rocky ledges, and had larger and rounder flowers than the viola. William Thompson and his employer, Lord Gambier, began crossing Viola species in the 1800s, selecting their plants for large flowers, color combinations, and unusual colors. Thompson found a bloom that had blocks of color on the lower petals and named it 'Medora' in 1839. The variety became popular across Europe. By the end of the century, a single-colored form with no "face" was bred by a Scottish grower, Charles Stewart. Pansies were also much admired in America. An 1888 mail-order catalog describes the pansy as "The most popular of all flowers grown from seed." They remain a popular garden flower today.